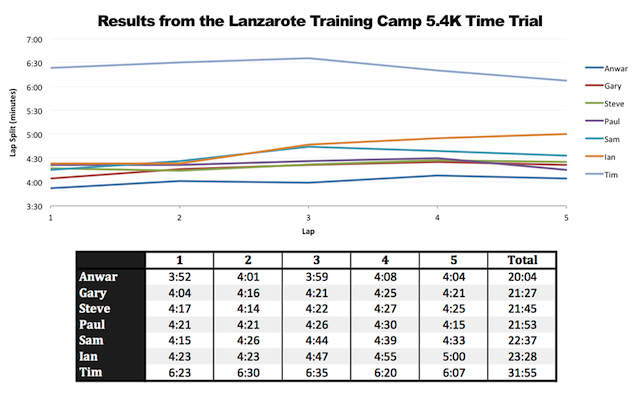 Scattered throughout the Lanzarote training camp schedule were a selection of events and competitions. Their results, when I wasn’t experiencing technical difficulties with timing (pen and paper backup is essential), were recorded, but with a packed schedule they’ve remained on my laptop until now. While I’m busy catching up on emails, I thought I’d use my lunch break to put together a few tables of results. I like statistics, so these are a small selection of statistics from the camp. Technically the second timed event of camp, but the early morning Critical Swim Speed test was hampered by technology failures and poor memories; lesson learnt for next year. Seven athletes gathered outside the hotel to see how quickly they could complete 5 laps of a local loop. 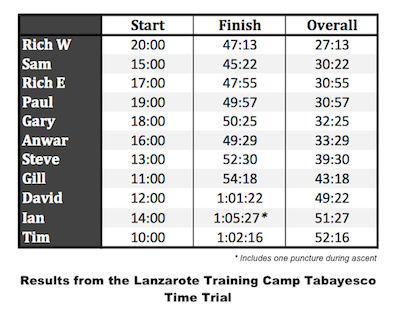 With relatively fresh legs at this stage of camp there were some good results and quite even pacing. My favourite climb on the island and perfect for a time trial (it has its own Facebook group). We rode sign-to-sign at 1 minute intervals carefully timed by Mark and me. Legs were tired after 5 days of riding and the full Ironman course the day before, but the athletes dug deep, a few collapsing over the line. Back on Sunday’s time trial route we asked our athletes to guess how fast they could cover 5.4K at the end of a heavy training week. Then we stole their watches – an unpopular move – and asked them to hold that pace without outside assistance. 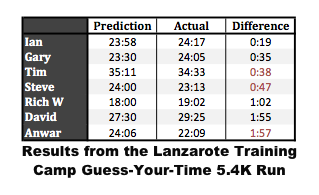 The winner would be the one closest to their predicted time. 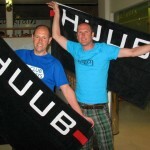 As it happens Ian, our second Huub towel winner, proved the most accurate in his predictions. 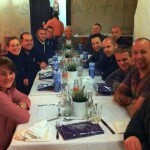 The camp was more about volume at this point in the year – a week of hard work you wouldn’t manage at home. The times reflect the fatigue that built over the course of a heavy training week, but throwing in a few faster sessions broke the week up and kept things fun.